An Auchentoshan so good, only Hunter Laing could bring it to you. Hunter Laing & Company is one of those old-time independent bottlers with a serious knack for finding rare casks of Whisky and issuing special, limited release bottlings that preserve all that character. That's what they do and they do it really well. They have issued a few custom blends, but they specialize in Single Malts. And if you are a fan of Scottish Single Malt Whisky in it’s purest state, you are a fan of Hunter Laing. Auchentoshan is one of the few, classic Lowland Single Malt distilleries still producing today. Auchentoshan 17 Year Old 1997 is a part of Hunter Laing’s “Old Malt Cask” line of special editions — and we know a lot about it. We know that this is cask #10890 from the 1997 vintage that was bottled in 2014 at a savory 50% ABV. And where some special releases span hundreds and even thousands of bottles, there were a total of only 313 bottles produced. Whether you want to sample something special or add it to your collection, this is a rare opportunity indeed. 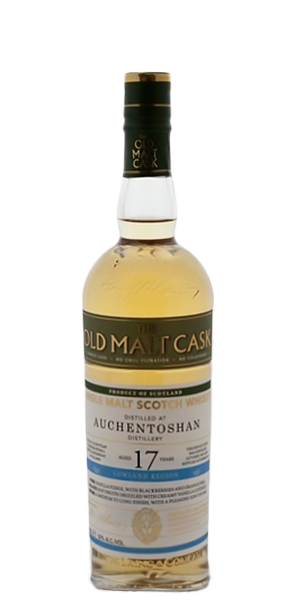 What does Auchentoshan 17 Year Old 1997 - Old Malt Cask taste like? The Flavor Spiral™ shows the most common flavors that you'll taste in Auchentoshan 17 Year Old 1997 - Old Malt Cask and gives you a chance to have a taste of it before actually tasting it. Long, with oaky notes on the tail. I would give it 8,5 rate if possible. I liked it very much. It is only that I do not link vanilla to whiskey. That is my problem though.